The College of Sound & Music Production (COSAMP) is owned and operated by PKY Media Pty Ltd, and was founded by Peter Frawley, David Santamaria and Kye Thomas. PKY Media also operates Salt Studios. We take a unique approach to delivering training and resources for secondary school music departments, by focusing on supporting teachers and schools with classroom materials, expert advice and professional development services. As a result, we’ve become a leader in our field, working with public, independent & catholic schools in all states and territories in Australia and now New Zealand! COSAMP was created in 2009 when Peter, David and Kye recognised the need for a supportive approach to providing auspice services and teaching resources for VET Music Teachers in Australia and combined their talents. Kye had been developing the basis of the resources library with its lessons, exercises and assessment tasks since 2007. David had created “My Class Record”, the pre-cursor to “Total VET” and had years of classroom teaching experience, whilst Peter founded Salt Studios in 2001. What sets COSAMP apart from its competitors in the education sector is its genuine music industry perspective. Continuing to operate our successful commercial recording studio, Salt Studios, means that we are totally in touch with the trends of today’s music production industry and the needs of tomorrow’s industry entrants. We are in a unique position to pass that knowledge on to teachers and their students through our industry relevant teaching resources and through providing the use of our facilities and expert staff to member schools. Over the past 6 years, COSAMP has developed a complete guide to contemporary music production studies for secondary schools with teacher and student websites. The COSAMP resources are also a fully compliant VET training system with nationally recognised outcomes, suitable for standard school music programs, but also adaptable across a variety of Australian syllabi. The COSAMP resources are now enjoyed by around 200 schools across Australia. COSAMP is a Registered Training Organisation (RTO#41549). In 2013, over 2000 school students and teachers received Certificates and Statements Of Attainment that are recognised nationally by any Registered Training Organisation and by employers throughout the industry. All teaching staff involved in COSAMP school programs are audited for their training and assessment qualifications, vocational skills and are offered ongoing professional development for their current industry skills. COSAMP has produced the definitive resource package for Music and Technical Production training. Previously called the Tech Production Network (TPN), the COSAMP resources are a compendium of learning tools for incorporating music technology into music study programs. Consisting of purpose-built teacher support materials, an interactive study guide for students and a variety of practical and theoretical tasks and activities, the resources encourage a holistic approach to program design and delivery. We empower teachers with relevant industry knowledge and support while providing engaging, interesting and contemporary learning materials for students of all ages and all learning styles. COSAMP’s resources are completely adaptable to suit virtually any music-related training program within a variety of learning environments from Year 7 skill level to post-secondary. The teaching materials can be mapped to any school-based, state-based or national syllabus for Music, Music Technology or Sound Production plus VET Music studies in the current CUA Creative Arts & Culture training package. 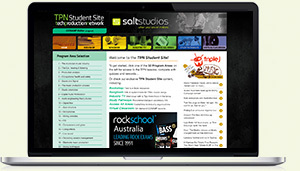 The Student Site houses all of the resource materials accessed by students for a range of our programs. For the TPN VET and TPN Australia programs, use of the Student Site is intended to be directed and facilitated by the member school teacher, according to the relevant syllabus and program design. The Student website is like a big reference text for students in COSAMP programs. While their school’s program may only use certain lessons and components of the site, students have access to the entire resource for each full school year and are welcome to explore broader concepts under their own direction and maybe discover new passions! The student site includes 6 feature areas which sit outside the framework of Program Areas and offer extra support for teachers and students. A collection of links to text and e-book resources for your program, with links to secure and reputable sellers. An archive of information about over 750 classic songs from the 1950’s to now including links for listening to and reading about each song, and download chords / tab. An archive of short movie interviews with Music Industry pro’s in a casual interview style, sharing their stories of working lives and their advice for young music students wanting a career in the industry. Provides hundreds of useful links to state based music industry networks and organisations. Learn who’s who in the industry and where to get support in starting you career. The Virtual Classroom gives teachers and students on-demand access to music production lessons delivered by COSAMP. The list of lessons includes archives recordings of live Virtual Classroom events, broadcast nationally. Kye Thomas has many years of experience as a musician, songwriter, performer, recording engineer / producer and audio lecturer. He has held senior positions at various RTO’s and has been designing music technology based teaching resources for VET in schools for a number of years. Having been a member of National Project Review Group for the previous CUS09 Music training package, Kye was again consulted on the design of the current CUA Creative Arts & Culture training package. As General Manager of COSAMP, Kye is responsible for overseeing the development & continuous improvement of the full suite of COSAMP online resources. Eve holds a Bachelor of Arts in Education and Social Sciences and has worked extensively delivering a range of different programs and packages within the not-for-profit sector at a multidisciplinary level. Having started her own successful food business with knowledge and experience across the many facets of this, Eve is delighted to be part of a dynamic business delivering unique and specialised educational opportunities within the music industry. Eve also brings her love of all things music, having had lifetime involvement in various forms of the creative arts including dance and choir. Lee joined the team in 2018 to boulster the administrative department and bookend an exciting 12-18 months of transition for COSAMP. With over 10yrs experience in compliance and business systems, Lee’s previous work in the education management industry balanced key RTO knowledge with skills in network administration, database management and data analysis. Lee is excited to expand her knowledge of the VET in Schools sector, assisting COSAMP with procedure development, student management systems and day-to-day client management and customer service. Simon has been playing music professionally since 2002, performing weekly residencies and corporate gigs around Australia as well as organising many grassroots artist showcases and open mic nights. Having recorded & released two acoustic EPs and two full length albums, Simon has also toured with premier Australian artists like The Basics, Lachlan Bryan & The Wildes, Nicholas Roy and more. With a background in graphic & web design and client relations, Simon came on board in mid 2014 in a marketing capacity, also managing key membership campaigns and sales across COSAMP’s products. Dylan is a professional studio and live performance musician who has been working in the Melbourne Music Scene since 2003. With proficient skills both as a musician and a studio/live engineer, Dylan has carved a successful career out of his passion for music and music production. Although he has been recording at Salt Studios since around 2004, he became part of the team in late 2015, managing the studio and working as a hands-on producer and engineer. In 2018 Dylan moved to a Training Manager role for COSAMP’s Certificate IV in Music Industry (Sound Production) course. Peter Frawley has been involved in the music industry for over 25 years and since then has gained a wealth of experience across many sectors of the industry. Peter’s skills include studio and live recording, overseas touring and event management. Peter co-founded Salt Studios in 2001 and since 2005 Salt Studios has recorded and produced over 1500 live performances in venues all over the world. These recordings also include the release of nearly 40 instant live albums of many well known Australian and international artists. Peter manages the accounts and finances for both COSAMP and Salt Studios. Designed to be a highly flexible recording/mixing suite, Studio A is a comfortable and inspirational recording environment for both the musician and engineer. The heart of the studio is a 40 input Amek Hendrix analog recording console. The console has an easy to understand signal flow and features Amek’s famous “classic British” pre-amps and EQ. A Pro Tools HD3 system handles all tracking duties and includes and extensive range of plug-ins. Monitoring options consist of Event Opals, Focal Solo6Be and Yamaha NS10. The recording space features natural light and flexible acoustics with two isolated recording booths adjoined. Salt’s mic collection includes some classic models by Neumann, Coles, AKG and Shure. Studio A is a great space for our Studio Excursion program, giving students a fantastic opportunity to be recorded professionally and learn recording techniques. Studio B is a purpose built suite that houses a range of high-end music production tools. 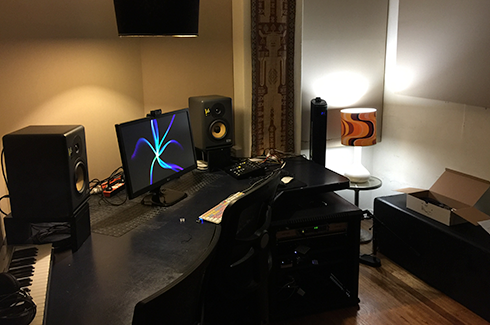 It’s an ideal space for producing and creating music, as well as leaRning music production techniques face to face with an industry professional. The centrepiece of Studio B is an SSL Nucleus control surface and interface featuring SSL’s ‘Super Analog’ mic preamps and a very intuitive method of controlling almost every parameter within your session. The studio is equipped with all major DAW’s including Pro Tools, Logic, Abelton Live, Reason / Record as well as a vast array of plugins and virtual instruments. Studio B is a very comfortable workspace with natural light and easy access to all other amenities within the facility, also used in our Studio Excursion sessions to demonstrate professional mixing techniques. For more information about our facilities, please contact us via email! Conveniently located in the heart of Melbourne’s bayside area, COSAMP is easily accessed by car or by public transport. The 64 tram that travels down Swanston St and St Kilda Rd terminates just outside the COSAMP facilities and there is an awesome collection of cafes shops and restaurants.